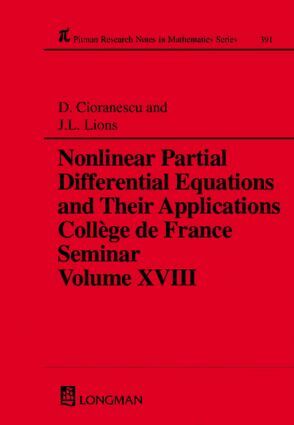 This book presents the texts of selected lectures on recent work in the field of nonlinear partial differential equations delivered by leading international experts at the well-established weekly seminar held at the Collège de France. Emphasis is on applications to numerous areas, including control theory, theoretical physics, fluid and continuum mechanics, free boundary problems, dynamical systems, scientific computing, numerical analysis, and engineering. Proceedings of this seminar will be of particular interest to postgraduate students and specialists in the area of nonlinear partial differential equations. A Nonlinear Lax-Milgram Lemma Arising in the Modeling of Elastomers. Regularity for Solutions to the Equation of Surfaces of Prescribed Mean Curvature Using the Coarea Formula. H-Convergence for Perforated Domains. Some Mathematical Problems in Marine Modelling. A Modelling of the Stability of Aluminium Electrolysis Cells. Dense Oscillations for the Compressible 2-d Euler Equations. The Hysteretic Event in the Computation of Magnetism and Magnetostriction. From Three-Dimensional Elasticity to the Nonlinear Membrane Model. Turbulence et structures cohérentes dans les fluides. Construction d'une base spéciale pour la résolution de quelques problèmes non linéaires d'Oceanographie physique en dimension deux. Homogenization of Lattice-Like Domains: L-Convergence. Time Decays: An Analogy between Kinetic Transport, Schrödinger and Gas Dynamics Equations. Théorème d'unicité et contrôle pour les équations hyperboliques. Shock Waves in General Relativity - A Generalization of the Oppenheimer-Snyder Model for Gravitational Collapse. Nonlinear Wave Equations. Mathematical Models of Hysteresis - A Survey.